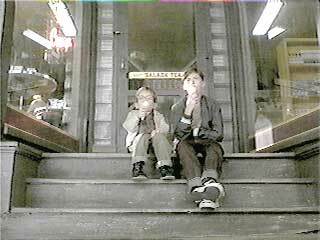 Joseph Mazello and John Robinson wear black low cut and optical white high top Converse “Chuck Taylor” All Stars in the film. 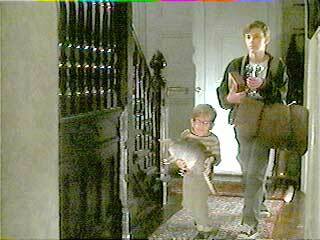 Simon Birch and Joe Wenteworth grow up together in a small New Hampshire town. Simon Birch is another film (see The Sandlot, Stand By Me, or The Three Wishes — also starring Joseph Mazzello) that is told by an adult looking back on important experiences and friendships of his youth. In this film, the adult is played by Jim Carrey in an uncredited role. The story focuses on two adolescent boys growing up in the early 1960’s in a small New Hampshire town. Joe Wenteworth (Joseph Mazzello) is pretty much a normal kid except for the fact that he has no identified father, and his mother, Rebecca Wenteworth (Ashley Judd), refuses to name him. They both live in Grandma Wenteworth’s (Dana Ivey) very large house. His best friend Simon Birch (Ian Michael Smith) is probably one of the brightest kids in town, but suffers from the physical defect of dwarfism and the neglect of his parents who generally refuse to acknowledge his existence or be seen with him. Because both kids are misfits, they hang together and actually seem to have a lot of fun swimming, camping, and bicycling around town. Simon never lets his small size get him down or stop him from doing all of the things the other kids in town do. We see him batting in a Little League game (his strike zone is about 6 inches) and speaking out in church when he feels that something the minister, Rev. Russell (David Strathairn), says or Miss Leavey (Jan Hooks), the Sunday school teacher does is wrong. His optimism and positive attitude about life even in the face of adversity and criticism about his brash behavior never seems to affect him, because he believes that he has been put on earth to fulfill a special mission from God. Joe doesn’t have the same self-confidence. He is desperate to find out who his real father is and is resentful of the suitors who occasionally pursue his very beautiful mother. However, early on in the film, a new suitor arrives, Ben Goodrich (Oliver Platt), who Rebecca met on the train from Boston and brings home for supper. (Grandma Wenteworth notes in an aside that the last time Rebecca met someone on this train, she came home pregnant.) And Ben is different from the other suitors. A local drama teacher, he seems genuinely interested both Rebecca and the boys. Simon and Joe remain best friends even through adversity. After Simon Birch introduces us to its main characters, and you get to know them a little, the film suddenly takes some tragic turns. Simon becomes the hand of God, but not in the way that he would have ever planned. While taking a turn at bat in a Little League game, Simon is actually instructed by the coach to swing at the ball. (Normally he is told just to stand there and take a walk because pitchers usually can’t find his miniscule strike zone.) When he does swing, and actually hits the ball well, in a fluke accident the ball veers and hits an unsuspecting Rebecca on the temple, killing her instantly. This is doubly tragic because Rebecca was just as much of a mother to Simon as she was to Joe. She was one of the few people in town who was really accepting of Simon for himself, treating him like her own kid and encouraging the friendship between the two boys. And worse yet, she died without ever revealing to Joe who his father really is. At first this tragedy causes a rift between Simon and Joe, but soon it is clear to Joe that the tragic event was an accident, and with him becoming for all intents and purposes an orphan, he needs Simon to help him sort through things and find out who is father really is. There are scenes in the film that are both touching and humorous, as the boys pursue the search for Joe’s father, participate in a Christmas pageant, and confront some cruel twists of fate in their lives. It would spoil your first time enjoyment of Simon Birch to reveal any more of the story here, but be prepared for some strong manipulation of your emotions. Joe’s mom, Rebecca, and her new boy friend, Ben Goodrich. In some ways, Simon Birch may remind you of a Charles Dickens story, with clearly defined characters always on the edge of optimism and tragedy. There is a lot of melodrama toward the end of this film, and you will find this film very much a “sentimental journey.” Director Mark Steven Johnson lets the story be told in a clear and concise manner that is designed to manipulate your emotions, and it’s easy to get involved in the intense melodrama of the plot. Ian Michael Smith’s performance as Simon is surprisingly fresh and different, because he makes us sympathize with his character without feeling sorry for him, always projecting the attitude of “I don’t feel sorry for myself, why should you?” It’s also nice to see a kid’s character not afraid of using his mind and speaking out about morality, very different from what usually is uttered by adolescents in today’s media. The real star of this film is Joseph Mazzello, however. He gives a lot of complexity to his character, that might not seem apparent at first, because it doesn’t ever seem that he is overacting. On the one hand, he gives us the aura of a normal kid who enjoys the typical activities of every young boy while showing loyal support for his diminutive friend. Yet we also see someone troubled by his lack of a father, haunted by the tough blows life has given him, and searching for his own personal identity. This performance is especially interesting, if you have seen Mazzello’s earlier performance in The Cure, where he has the opposite role in a pairing with Brad Renfro. Ashley Judd is radiant as Rebecca Wenteworth, and part of the film’s tragedy is that you would like to see more of her. 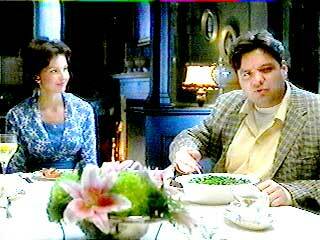 There are also credible performances by Oliver Platt, Dana Ivey, David Strathairn, and Jan Hooks. Simon and Joe try to figure out who Joe’s father could be. 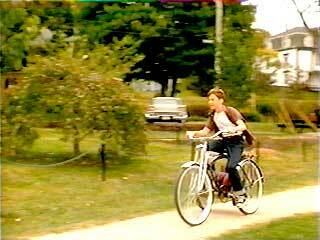 Joe rides his bicycle through town. Joseph Mazzello is seen wearing black low cut chucks throughout much of Simon Birch, and we also briefly see white high tops worn by Joe’s swim coach, Mr. Baker (John Robinson). There are not many closeups to comment on, but there are a few interesting visual sequences, like when we see Simon and Joe racing down through the woods to the local swimming hole, on the stairs of Joe’s porch, or bicycling through town. Mr. Baker, Joe’s swim coach, wears white chuck high tops. Simon Birch. (1998) Ian Michael Smith, Joseph Mazzello, Ashley Judd, Oliver Platt, David Strathairn, John Robinson. Directed by Mark Steven Johnson. Categories: Drama, Family.